An Original Growing Plant Illusion. 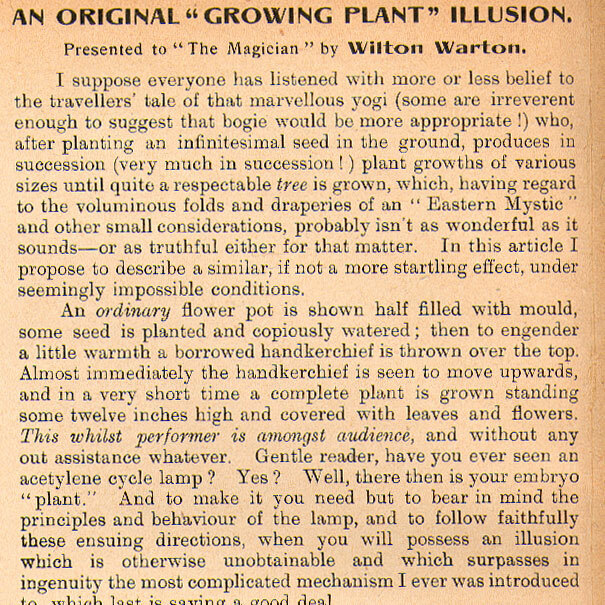 Presented to “ The Magician ” by Wilton Warton. April 20th 1906. I suppose everyone has listened with more or less belief to the travellers’ tale of that marvellous yogi (some are irreverent enough to suggest that bogie would be more appropriate !) who, after planting an infinitesimal seed in the ground, produces in succession (very much in succession !) plant growths of various sizes until quite a respectable tree is grown, which, having regard to the voluminous folds and draperies of an “ Eastern Mystic ” and other small considerations, probably isn’t as wonderful as it sounds—or as truthful either for that matter. In this article I propose to describe a similar, if not a more startling effect, under seemingly impossible conditions. An ordinary flower pot is shown half filled with mould, some seed is planted and copiously watered; then to engender a little warmth a borrowed handkerchief is thrown over the top. Almost immediately the handkerchief is seen to move upwards, and in a very short time a complete plant is grown standing some twelve inches high and covered with leaves and flowers. This whilst performer is amongst audience, and without any out assistance whatever. Gentle reader, have you ever seen an acetylene cycle lamp ? Yes ? Well, there then is your embryo “plant.” And to make it you need but to bear in mind the principles and behaviour of the lamp, and to follow faithfully these ensuing directions, when you will possess an illusion which is otherwise unobtainable and which surpasses in ingenuity the most complicated mechanism I ever was introduced to, which last is saying a good deal. Upon a flat board pin down with stout drawing pins two sheets of thin india rubber 15 ins. by 8 ins. (which must be absolutely faultless) one upon the other. Now, with a sharp knife,cut out the shape of a tree or plant with spreading branches. The root or trunk must be not more than 1 1/2 to 1 3/4 ins. in width, the remainder must, of course, be in proportion, or your “ plant ” will bring you more ridicule than applause, by a long way. Now to the extent of 1/8 inch all round outline of ‘ tree ’ when completely cut out, spread bicycle rubber solution, leaving the mouth of the ‘root’ untouched. Having done so and adjusted your two rubber ‘ trees ’ exactly (wait till solution is ‘ tacky ‘ or it won’t stick well), rub and press them firmly upon each other and leave under pressure until perfectly secured. Into the open ‘root’ is inserted permanently a small box of brass working upon a hinge; in the top half, i.e. that inserted in the ‘neck ’ of the affair—a 1/8 inch hole is cut. The lower half is drilled with as many small holes as you can get into it, without destroying it entirely. To operate this affair you cover and paint the trunk, limbs, etc., with leaves, and small artificial flowers, and, when dry, turn in all branches to centre and then fold the whole in ‘pleats ’ as neatly as you are able from top downwards to within two ins. of the box or ‘receiver,’ then tie with thin thread into a compact parcel (not too tight). Place a lump of calcium-carbide within the receiver, close same securely and place the complete arrangement on a servante, or in pocket, etc., (according to your ‘ pet ’ method of loading). In filling plant pot with mould the load which has been secretly got into the pot is brought to the top and the root and box buried beneath the soil the ‘ plant ’ itself is merely sufficiently covered to pass muster at a short distance away. Now it is evident that as soon as the water penetrates the mould and reaches the carbide, gas commences to generate, which naturally escapes by the most open route which is in this case via the 1/8 inch hole in top of receiver and thence into the plant itself spreading it out and erecting it into a full blown tree. Any surplus gas will make its way out through the mould which acts as a safety-valve thus obviating the least danger. This novel and interesting application of acetylene gas is most ingenious and suggests experiments in other directions.